Home Family Where Does It Come From? Some of you who have known me for many years wonder where my interest in personal finance (expressed in my Lose Your Money Blues blog) comes from. I sometimes wonder myself. I like to be tacky and mention dollar figures out loud, and I see your shudders when I do. But from where do I get this passionate interest in money? Here’s a typical end-of-year page from the household account books my mother kept faithfully all her life until dementia intervened. It has a facing page with as many columns, also filled in. Just looking at these figures makes my eyes glaze over, proving I am not a total numbers geek. I have never kept my own household financial information in such detail, nor do I aspire to. Perhaps that is why for a number of years I did not know what the heck was happening with my personal finances. Only when I sensed I was nearing the edge of a cliff did I wise up and start paying careful attention. My mother was paying attention all along. My mother was in charge of making sure that every penny of my father’s salary and her own small inherited income went as far as it could to keep a family of five in suburban middle-class comfort after World War II. 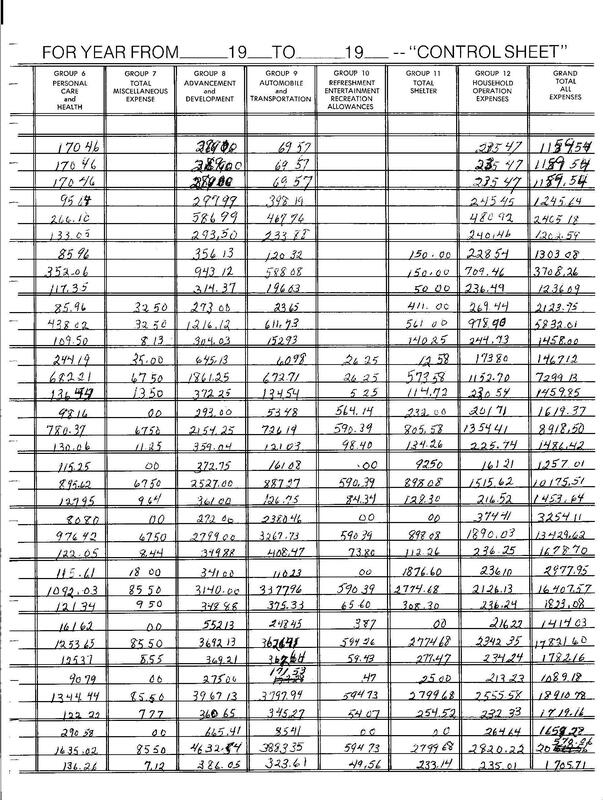 Her account books tracked the expenses and made it possible for her to forecast and to spend as appropriate. She was not a “bean counter,” that pejorative term for someone obsessed with dollar figures but blind and deaf to the meaning and value of money as it is spent. To the contrary, throughout my youth she took all her children to cultural events that cost money. We had private music lessons for years, and of course there was ballet, scouting, summer day camp, and more. Our home had luxuries. I never felt I was living a straitened existence. Looking at her neat handwriting with its occasional write-overs (she obviously was no fan of correction fluid), I am humbled as usual by my mother’s many accomplishments. She was a brilliant student at the University of Chicago, a student of history, not finance. Her grandfather had founded a manufacturing company while also the editor of a small town newspaper, so perhaps she got some of her financial acumen from him. Her grandmother had played the stock market and parlayed a few hundred dollars left in a bank account into a respectable fortune, so maybe it came from that side of the family. Until recently, it had not occurred to me that my own interest in personal finance is inherited. Now I suspect it is, although I can’t do the quick multiplication in my head that my mother could. This book from years ago also shows something else. The highest category of spending listed is “Advancement and Development.” That’s what my mom used to chart her charitable giving and personal gifts. By being so careful to note even the purchase of a candy bar on other pages, and to total them as the months went by, she formed the habits that left her with money each month she could freely use to support causes dear to her heart and her soul. My own efforts in personal finance self-education are attempts to give my financial life that same leeway. I can’t hope to achieve her level of seemingly effortless organization, but I’m trying.